FILE PHOTO: France Minister of Sport Laura Flessel gives a speech at the presentation of Paris 2024 at the 131st IOC session in Lima, Peru September 13, 2017. 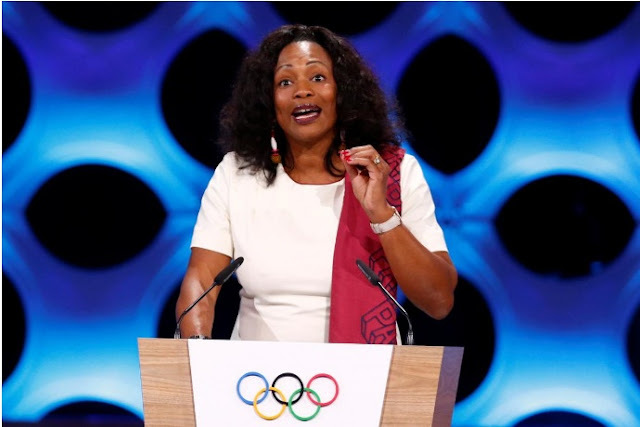 PARIS/SEOUL - France’s Winter Olympics team will not travel to the 2018 Games in South Korea if its security cannot be guaranteed, France’s sports minister said on Thursday, the first major doubts by a participating nation about growing North Korean tensions. The games organizer said on Friday that it is closely monitoring the current geopolitical situation with the South Korean government, adding that safety is the top priority. The games are scheduled for Feb 9-25 next year in Pyeongchang, just 80 km (50 miles) from the demilitarized zone between North and South Korea, the world’s most heavily armed border. The two countries remain technically at war after their 1950-53 conflict ended with a truce and not a peace treaty. “Safety and security is one of the most important aspects of Games preparations,” Sung Baik-you, a spokesman for the organizing committee, said in a statement to Reuters on Friday. “Each host city presents a unique challenge from a security perspective, and, as is always the case, we are working with the organizers, the U.S. State Department and the relevant law enforcement agencies to ensure that our athletes, and our entire delegation, are safe,” USOC spokesman Patrick Sandusky said. France’s Winter Olympics team will not travel to the 2018 Games in South Korea if its security cannot be guaranteed, France’s sports minister said on Thursday, the first major doubts by a participating nation about growing North Korean tensions.